Bud Vase in Vaseline Carnival, Bargain Shack offers Boyd Glass, Mosser Glass, L.G. Wright, and Contemporary Collectible Glass including Vaseline Glass - J.B. Scottie Dogs, Pooche, Animal Covered Nests, Toothpick Holders, Salts, Glass Animal Figurines, Clowns, Dolls, Slippers, Vehicles, and More! 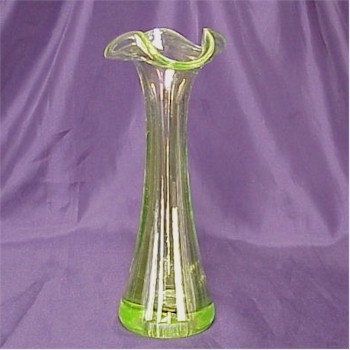 This Bud Vase in Vaseline Carnival from Gibson Glass is so cute! It stands over 6 inches tall and the bottom of the bud vase is marked Gibson 2005. Made from pure vaseline glass sprayed with a beautiful carnival finish this piece is sure to have a special place your collection. Each vase was handmade by one of Gibson's glass artisans. The company is no longer in business and this piece is sure to be a great addition for the rare vaseline glass collector.